If you have grass as a part of your landscape, the most important tool you’ll need other than a lawnmower is a string trimmer. This is the piece of equipment that applies the real finishing touch to your lawn care work. Let’s look first at what you should get. As with any type of tool or equipment, a wide range of choices exists in terms of size, style, brand name, weight, and of course cost. While the generalization “bigger is better” is certainly not always true, in the case of string trimmers, I think it’s a pretty good rule of thumb. If you can afford it, get a professional model trimmer with at least a 20 cc displacement 2-cycle engine. This is a good heavy-duty trimmer that will easily handle any basic homeowner grass trimming you’ll encounter, and will still serve you well if you move to a home with more extensive grounds or if you decide to contract some weekend grass cutting and trimming jobs to make extra cash. What other features, besides an engine big enough to do the job without bogging down, should you look for in a string trimmer? Two things I would avoid are the curved shaft trimmers and the electric-powered trimmers that, of course, require you to be attached to an extension cord you’ll have to drag around. Unless you have a very small budget and an even smaller grassy area to maintain, don’t frustrate yourself with these lightweights. 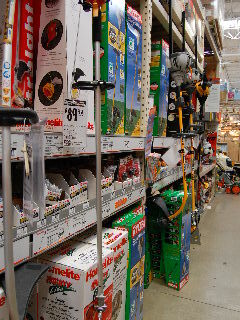 As far as brand name goes, two reliable brands of string trimmers that have been on the market for quite a few years and that I have had very satisfactory results with are the ones made by Stihl and Shindaiwa, although I’m sure other makers are producing and marketing good equipment. Visit the dealers and let them demo their products for you; also, ask your friends what kind of trimmers they’ve experienced good results with before you make your investment. Now that you have a well-made, heavy duty, reliable string trimmer in hand, let’s look at a few things you can do to maximize its usefulness and its longevity. First of all, read the manual that comes with your equipment to be sure you fully understand its operation, and keep the manual in a handy place so you can refer to it as questions arise about parts replacement (such as spark plugs or air filter), the proper gas/oil ratio to use in the 2-cycle engine, and lubrication and maintenance over the life of your trimmer. And speaking of spark plugs, one of the easiest things to do in order to keep your string trimmer running efficiently is to remove and clean the spark plug periodically. This keeps sooty black carbon deposits from building up on the plug, which causes poor ignition and loss of power. Also, be sure you purchase the proper spark plug for your trimmer when it’s time to change out the plug (remember that advice about consulting your owner’s manual?). Another place carbon deposits can build up and rob you of power is in the exhaust and muffler system. Periodically remove the muffler (be sure it’s cool!) and use a screwdriver to loosen and scrape out any sooty residue building up inside the muffler and exhaust port. Most mufflers have a spark arrester (a piece of screen mesh) inside, which can also clog with residue; be sure you clean this thoroughly before putting the muffler back in place. Pay close attention to the air filter, too. This is usually just a small piece of spongy material in the air intake/choke mechanism that becomes easily dirtied from all the dust and fine grass particles flying around in the air. Remove this sponge occasionally, clean and oil it as per the manual instructions, and re-insert it properly. Here’s one final tip you might want to try, something I’ve discovered and used over the years. Try using the next smaller diameter of cutting line on your trimmer than the maker suggests (for example, try .080 instead of .095). 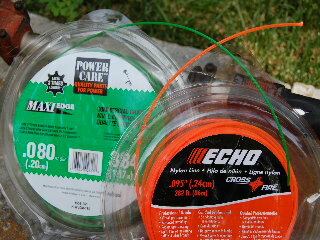 This way, you can wind more string onto the spool, resulting in more time trimming grass and less time stopping to re-wind string. Also, the smaller diameter (which is naturally lighter in weight) allows the trimmer to run faster and thus cleaner, resulting in less of that undesirable carbon build-up we’ve been talking about. Follow these basic maintenance suggestions, and your string trimmer should give you many years of top-notch performance instead of many hours of frustration.